Essential oils are antagonistic to pathogenic organisms on contact, which is why they are so effective when able to enter the respiratory tract directly, through inhalation. The therapeutic potential of essential oils is yet to be fully realised. An essential oil can cover a wide field of activity and in this article we will focus on the role aromatherapy can play when your horse suffers a respiratory complaint. Any condition or infection that involves the nose, throat, and lung would respond very well to essential oils. Inhalation is one very effective way of utilising essential oils, as when inhaled directly by the lungs they can cause an increase in protective bronchial secretion, which is beneficial for many respiratory ailments. Also by inhalation they are absorbed into the blood circulation even faster than by oral use so can be a more effective and safer option of use for your horse. When selecting essential oils for the respiratory system we look for essential oils that are expectorant, antispasmodic, balsamic agents, and/or antiseptic. Expectorants are useful for conditions with catarrh (mucus) which may include sinusitis, coughs, bronchitis, etc. Eucalyptus, pine, thyme, myrrh, sandalwood, and fennel are expectorants that encourage the passage of phlegm and other material in the lungs up the bronchial apparatus. With many respiratory conditions the self-cleansing action of the ‘mucocilliary escalator’ may get impeded or overloaded, and this is where these essential oils can be useful. Antispasmodics are useful when your horse has heaves or a dry cough, and include hyssop, cypress, Atlas cedarwood, bergamot, chamomile, lavender and cajeput. They can reduce spasm or tension, especially in the visceral smooth muscle of the bronchial tubes. Balsamic agents are my choice with colds, chills and congestion and often found in your old fashioned inhalations for when people used to steam their colds under a towel. They include benzoin, frankincense, Tolu balsam, Peru balsam, and myrrh. Antiseptics are what you use to assist with heavier flu or viral infections; they include thyme, eucalyptus, hyssop, pine, cajeput, tea tree, and borneol. Antiseptics are often described as fighting against infections, however more specifically they are antagonistic to pathogenic organisms on contact. This is why they are so effective when able to enter the respiratory tract directly. They are useful as negative ion generators in a barn where you wish to reduce the risk of spreading infection. There are several ways your horse can benefit from the use of essential oils when guarding off this condition or helping the body rebalance when recovering from a bug. It is not wise to use a candle burner in your barn, because unattended candles lead to disaster. so please do not do this. You can buy electric diffusers, and some come in protective casings so they can be kept dust free in the barn. You add your pure essential oils to the bulb and a small motor will disperse a fine spray of droplets. This can be set on a timer, and if you were to include an essential oil from each of the expectorant, antispasmodic and antiseptic groups, either combined or singular, you could ward off any lurgies. The balsamic resins will clog up the filter, so avoid these in diffusers. An alternative to this is type of diffuser is an electric ceramic bowl that is heated to help the essential oils evaporate, though there are some changes in the chemistry of your essential oils when you use heat to disperse. You can extend this inhalation principle to using warmed cupped hands. Simply warm your hands and place a few drops of your chosen essential oil onto them, and cup under your horse’s nose as needed. 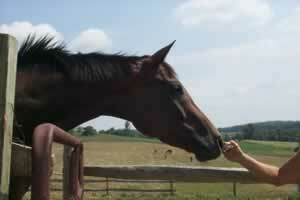 If you horse does have a respiratory tract problem, a chest rub is very supportive of the airways. This can be applied daily and rather than using a vegetable oil carrier, which can get sticky and rancid if you are unable to wash it off between applications, use a gel. You can use any appropriate essential oils. Researching the specific actions of each to understand which ones have an affinity with the respiratory tract will help you be more selective. Essential oils are very volatile and potent, so to achieve results with this application you only need a 2.5% dilution. For example, in a 1 fluid ounce bottle, add 30 drops of your chosen essential oils. in 1 fluid ounce of aloe gel. Apply two or three times a day to assist a stall bound horse recovering from a respiratory complaint. Ginger is an essential oil that is potent and present in the fresh root. Using the essential oil can be irritating to the sensitive horse, however if you cut the fresh root and add a couple of slices daily to a water bucket, your horse can drink the ginger flavoured water (have an alternative water source in case this is not to his liking). Ingested this way, ginger is very comforting and effective for conditions exacerbated by cold and chill, particularly those affecting the lungs and respiratory system. Atlas cedarwood is useful with most congestions along with stress related respiratory complaints. It is antiseptic, antiputrescent, astringent, fungicidal, mucolytic and sedative. Benzoin is useful with heaves, bronchitis and chills. It is antiinflammatory, antiseptic, astringent, and expectorant. Bergamot (may cause photosensitisation in some horses – if skin it is applied to is exposed to sunlight, they may develop a skin rash) is useful with colds, fever, flu, infectious diseases, and mouth infections. It is analgesic, antiseptic, antispasmodic, febrifuge, and a tonic. Borneol is specific for bronchitis and coughs and is antiviral, antiseptic, antispasmodic and mildly analgesic. Cajeput is useful for catarrh, sinus infections and viral infections. It is antimicrobial, antispasmodic, antiseptic, diaphoretic, expectorant and a febrifuge. Chamomile is helpful with allergies and respiratory complaints that may be exacerbated by nerves. It is carminative, antispasmodic and a tonic. Cypress is very astringent and will help dry up runny, watery mucus conditions, assist with heaves, bronchitis and spasmodic coughing. It is also antiseptic and antispasmodic. Eucalyptus – Any of the eucalyptus species can be employed with respiratory complaints; E. radiata tends to be preferred for fighting infection, while E. citriodora has bacteriostatic activity. Fennel is often used in human cough drops, and is useful with asthma and bronchitis. It is antiinflammatory, antispasmodic, depurative, and expectorant. Frankincense is a primary essential oil for heaves, clearing the airways and relieving the stress that comes with difficulty in breathing. It is antiseptic, carminative, expectorant. Hyssop is moderately toxic so use it in moderation and not during pregnancy. It is useful with heaves, bronchitis, catarrh and cough. It is astringent, antiseptic, antispasmodic, antiviral, bactericidal, expectorant. Lavender is good with heaves, catarrh, throat infections and cough. It is antimicrobial, antitoxic, carminative, hypotensive, sudorific. Myrrh is useful with heaves, bronchitis, catarrh, coughs, gum infections, sore throats and conditions slow to heal. It is anticatarrhal, antiinflammatory, antimicrobial, balsamic, and antiphlogistic. Peru balsam is useful for colds, heaves, bronchitis, and coughs (used in old style cough syrups). It is antiinflammatory, antiseptic, balsamic, expectorant, and parasiticide. Pine is used for colds, flu, heaves, exhaustion from lack of fresh air, sinusitis. It is balsamic, antimicrobial, antiseptic, antiviral, bactericide, expectorant and restorative. Sandalwood is preferred for dry persistent coughs, often irritated by dust or exercise. It is a pulmonary antiseptic, bactericidal, expectorant, fungicidal, and tonic. Tea tree is used to disinfect, for heaves, bronchitis, catarrh, coughs, and sinusitis. It is active against bacteria, fungi and viruses. Thyme is used for chills, colds, flu, infections, heaves, bronchitis, catarrh, and coughs. It is antimicrobial, antioxidant, antiseptic, antispasmodic, expectorant, and rubefacient. Tolu balsam works primarily on respiratory mucous membranes, chronic catarrh, and ‘cold’ chest complaints. It is antitussive, antiseptic, balsamic, and expectorant. It is important that you do not replace veterinarian care with essential oils. Some horses may need the attentions of your veterinarian.